Exercise AnyWhere is a free Windows 8 workout app that talks about the importance of maintaining energy balance in our body by adopting a simple workout schedule. Exercise AnyWhere is, in fact, a complete health guide that describes the importance and advantages of doing workout every day. The app guides about how often you should do a particular type of exercise, and give important tips to stay safe and injury-free while doing a workout. This free Windows 8 workout app also offer tutorials on some basic workouts, which you can easily do anywhere without any gym equipment. These exercises include Crunch or Bent Knee Sit-up, Cobra, Squat Jump, Push-up, Push-up with Single-leg Raise, Front Plank, Downward Facing Dogs, Inverted Flyers, and Mountain Climbers. The exercises are shown as beautiful step-wise pictures along with their textual descriptions in the app. 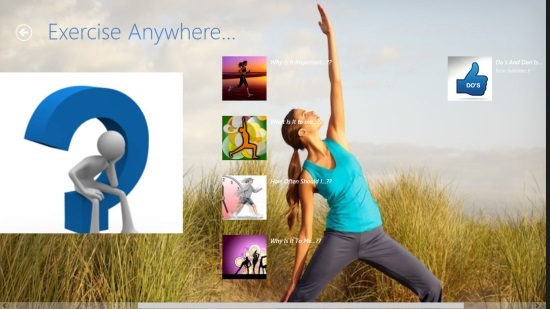 Exercise AnyWhere app is freely available in Health & Fitness category of Windows Store. You can also view the app directly in Windows Store using the link given at the end. Let’s have a detailed look at how the app works. As you install and launch this app on your Windows 8 system, it will take you to the main screen of the app. The main screen displays all the sections that the app contains, as picture tiles. Use the horizontal scroll bar to view all the sections. The first section ‘What is What’ describes the importance of doing exercise, how and why it is good for our body, what kind of workout schedule we should adopt, and a list of do’s and don’ts to stay safe and injury-free while doing a workout. As you click on the first tile, it will open up with a picture on the left and relevant text on the right side. Use the left and right headed arrows to navigate to the other pages of the section. The second section ‘Tips at Your Fingertips’ of the app discloses some helpful tips you should always keep on your fingertips to stay fit. These include taking a balanced diet, plenty of water, enough sleep, doing exercise and meditation, and engage in as much physical exercise everyday as you an. Click on the first tile to open it. Use the left and right headed arrows to move to the other pages of the section. The rest of the 9 sections of the app demonstrate some easy to-do exercises which you can do anywhere, and you don’t need any gym equipment for doing these exercises. The steps of these exercises are displayed as position-wise pictures along with textual description. As you click on any of these sections, you will see a position picture of that exercise on the left side of the screen. On the right side of the screen, the step-wise positions will be displayed in the form of picture tiles with a little description. Click on the first tile and you will be able to see the full description of the step along with its position picture. Use left and right headed arrows to view all the steps. The back arrow button on the top left side of the screen will take you back to the main screen. Free Windows 8 workout app. Easy to do exercises requiring no gym equipment. Beautiful step-wise pictures of exercises with descriptions. Mention of target body part for each exercise. Also check Windows 8 Yoga app and Windows 8 Calorie Tracker apps. Exercise AnyWhere is a nice free Windows 8 workout app. It is an informative health guide, especially for those who are beginners. The app also talks about the hazards of over-exercising, which is very important to know before adopting a healthy workout schedule. You must give it a try. Do share your feedback via comments.